WILLEMSTAD - Nineteen members assigned to U.S. 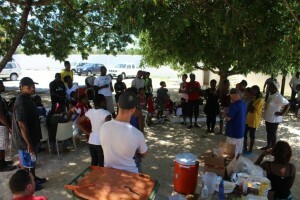 Forward Operating Location (USFOL) Curacao, supported a Kids’ Sports Day community outreach event held at the Holiday Beach Hotel. The USFOL members led and participated with 85 local youth and adults in playing soccer, flagfootball, basketball, dodgeball, volleyball, and swimming. This outreach event included a mid-day lunch serving hamburgers, hotdogs and drinks, and culminated with a fellowship time for all in attendance.